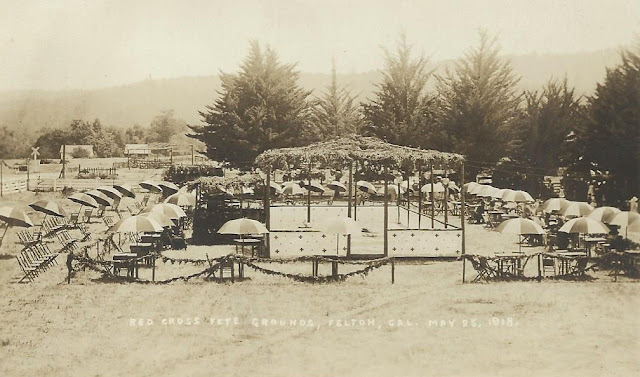 The town of Felton historically covered less than 2.5 square miles yet some of the most extensive railroading that occurred in Santa Cruz County happened here along the mainline track through the Santa Cruz Mountains and two branch lines. 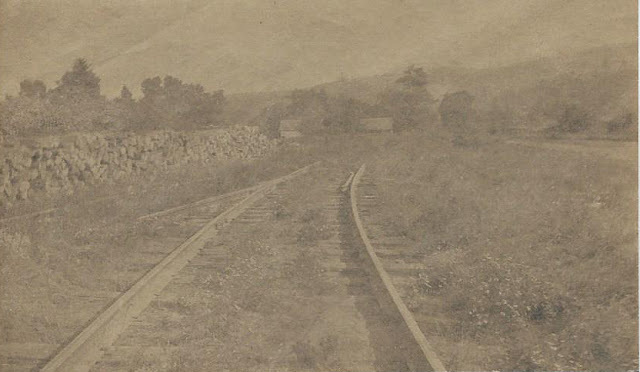 Often considered by local historians as the "Felton Loop," the railroad branches in Felton only actually formed a loop between 1908 and 1909, and the trains along one end were incapable of accessing the other due to differences in gauges. The original Santa Cruz & Felton Railroad followed the west bank of the San Lorenzo River, terminating just south of downtown Felton near where the Saint Lawrence Orthodox Church is today. 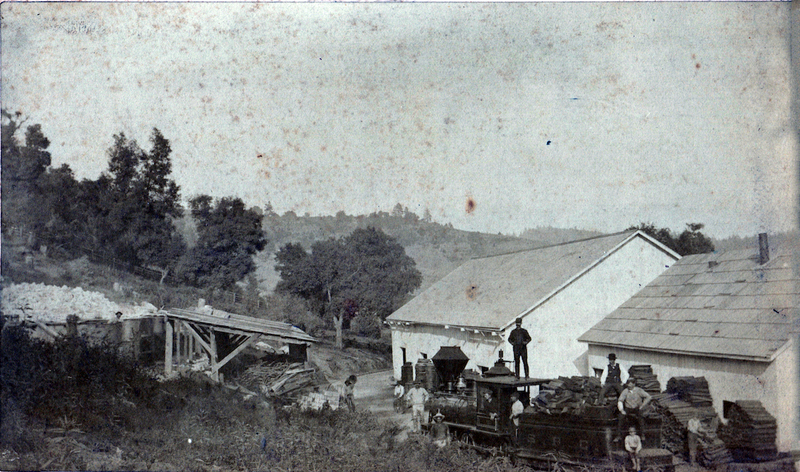 At Felton, trains received cut lumber sent from above Boulder Creek along the San Lorenzo Valley Flume, which operated to Felton from 1875 to approximately 1885. Kilnsmen atop and around a South Pacific Coast locomotive at the Holmes Limeworks outside Felton, c. 1890s. 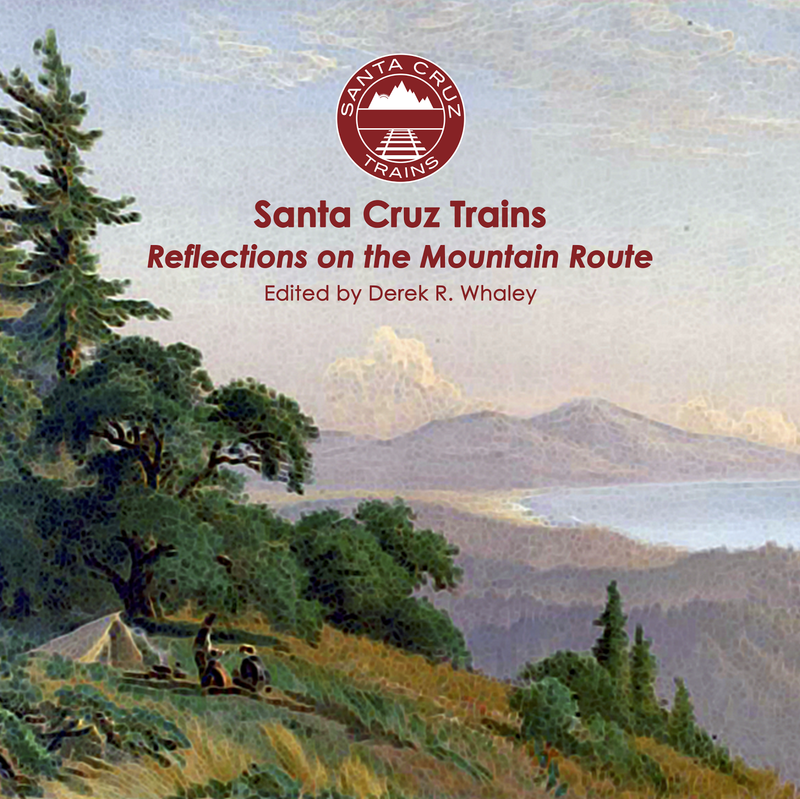 When the South Pacific Coast Railroad built its route through the mountains in 1880, the former trackage between Felton and Felton Junction, south of Big Trees, was renamed the Felton Branch. Two private spurs broke from this branch, one that catered to the H. T. Holmes Lime Company kilns on what would later become Hihn Street, the other south of town supporting an F. A. Hihn Company lumber mill along Gold Gulch. This branch was renamed the Old Felton Branch in 1887 when the Felton & Pescadero Railroad was rebranded as the Felton Branch (later, Boulder Creek Branch). Along the east bank of the San Lorenzo River, the South Pacific Coast Railroad built its mainline north from Felton Junction until it met with what the railroad called Felton Station, located a mile to the east of downtown Felton (the old station became "Old Felton"). 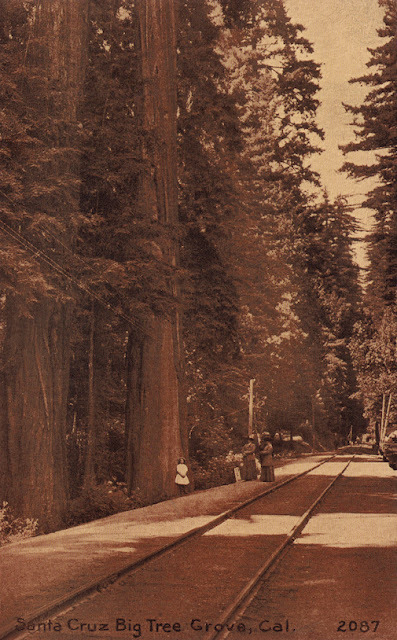 This short stretch of trackage catered to Big Trees and later to the Santa Cruz Lumber Company's planing mill and lumber yard. 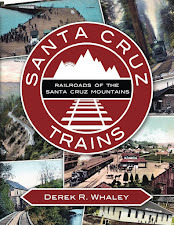 Beginning in 1884, the Felton & Pescadero Railroad (a South Pacific Coast subsidiary) was built from Felton Station to Boulder Creek to replace the increasingly inefficient flume. Eventually, a seasonal station known initially as River Station and eventually Riverside was erected in 1903 near modern-day Covered Bridge Park to cater to picnickers and people desirous of detraining within a short walk of downtown Felton. However, the branch remained on the east bank of the San Lorenzo River. 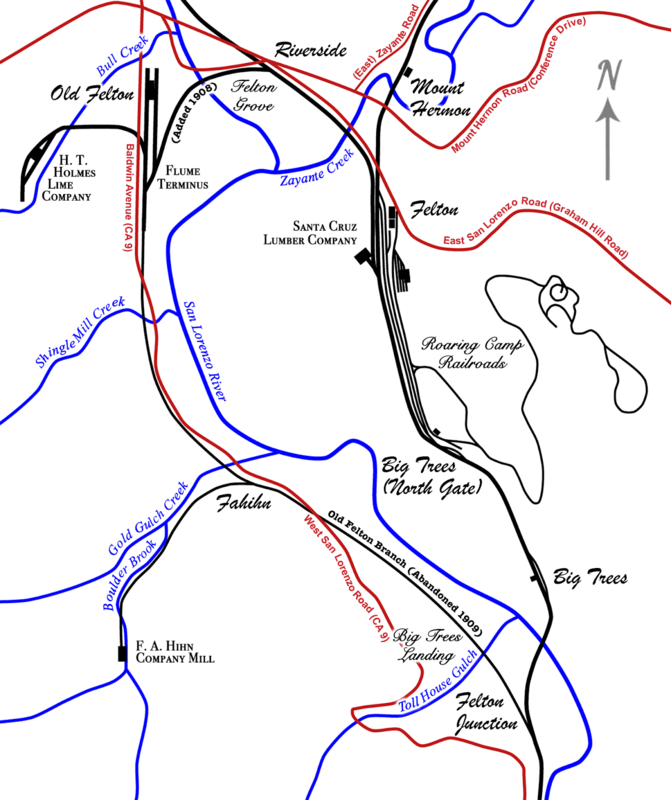 The standard-gauging of the various routes in the San Lorenzo Valley following the 1906 San Francisco Earthquake prompted Southern Pacific Railroad to abandon the Old Felton Branch, but not entirely. The railroad upgraded the trackage south of downtown, only abandoning the route south of today's Monty's Log Cabin. To reach this upgraded track and bypass the mile-long branch to the south, the railroad constructed a spur that crossed the San Lorenzo beside the Felton Covered Bridge and then turned south, merging with the former Old Felton Branch trackage near today's Quik Stop. The removal of tracks to the south allowed various communities including Tanglewood, Forest Lakes, Sequoia/Cotillion Gardens, Smithwoods, and others to grow south of downtown. 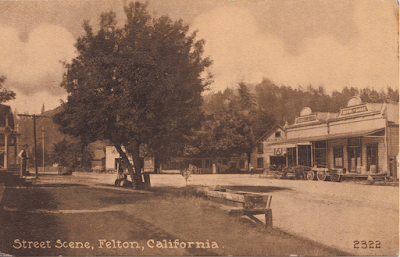 The Boulder Creek Branch was later removed in early 1934, but the spur to Old Felton remained in place until October 1939, when the lime operations outside of town finally shut down permanently. The standard-gauge tracks on the east bank remain intact today, although some of the sidings and spurs have been removed or reduced. 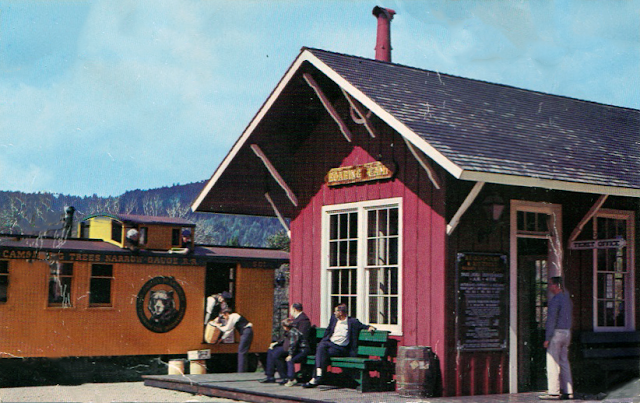 Roaring Camp Railroads added extensive narrow-gauge trackage to the top of Bear Mountain in the 1960s, and later purchased the remaining Southern Pacific trackage as well. Speculative business ventures of the 1870s were either focused on exploiting natural resources wherever found, or else overly influenced by their engineering departments. While one needs to remove 150 years of science and economics from the decisions made then, it still seems unclear why choices favored such scant returns. The original Felton track only needed one small bridge and a mile of track, the newer route needed two rather large bridges, a duplicate set of facilities supporting another station, and miles of track through an area not planned for development.